Fancy a round of golf with world number one Adam Scott? 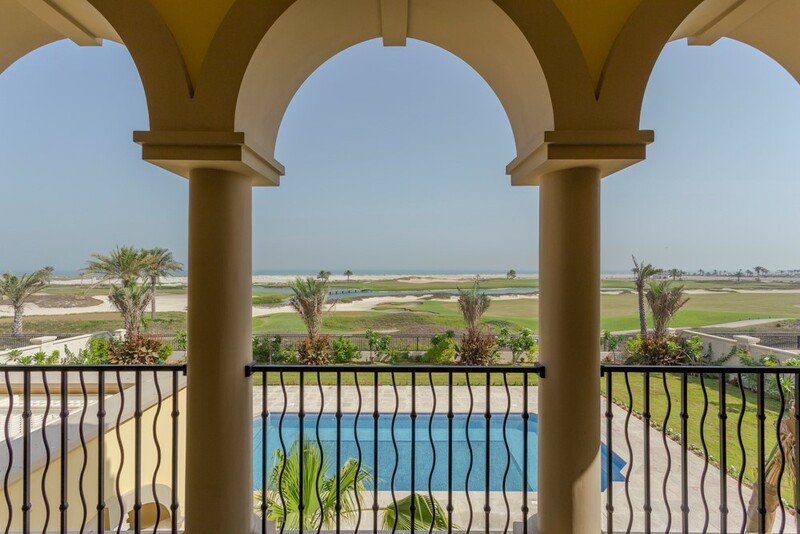 Here we take a look at his luxury villa fronting Saadiyat Beach Golf Course, for sale through Andrew Covill of boutique property agents Henry Wiltshire. The property has a built up area of over 12,000 sq ft, is fully landscaped with pool and situated on one of the most sought after positions on the golf course. It is finished with a palette of fine materials including natural stone floors, marble and mosaic bathrooms and kitchens featuring Gaggenau appliances, timber doors and granite worktops. The home is wired for sound and finished down to light fittings, ceiling fans, and even a buzzer system to summon staff. On the ground floor there are three living areas, indoor and outdoor dining, office, family kitchen, gym and guest suite. There are also ample back of house areas including service kitchen, two maid’s rooms, laundry and driver’s room. A choice of two staircases or an elevator will take you upstairs which has another family living area and pantry, three bedrooms with en suite bathrooms and walk in wardrobes and also a nanny’s bedroom. The master bedroom suite benefits from sweeping views over the lake and fairways of the eleventh and fifteenth holes. This stunning bedroom suite is comprised of separate sleeping and sitting areas, walk in wardrobes and a large, luxurious bathroom as well as private terrace. The villa is located adjacent to the community facilities comprising large pool and children’s pool, gymnasium and squash and tennis courts. It is also within a short walk of the golf clubhouse and a few minutes’ drive of the Monte Carlo Beach Club, St Regis and Park Hyatt hotels and the new shopping and dining arcade at ‘The Collection’. Cranleigh, the renowned English independent school, and the New York University are opening shortly with the first Louvre museum outside of Paris following next year. Henry Wiltshire estate agency Abu Dhabi provide property sales and leasing services in the Abu Dhabi area with a dedicated and experienced team. They also offer investment opportunities in London with full support and consultancy provided by the local office in association with their London offices. Estate agents in Central London are gearing up for a busy 2015!